This section provides a quick comparison of image quality of JPEG image files with some lower compression quality levels 75%, 50%, and 25%. After comparing JPEG images with high compression quality levels: 95%, 90% and 85%, I want to look at some lower levels: 75%, 50% and 25%. 1. Open GIMP-Red-Gradient-Spiral.xcf and save it as GIMP-Red-Gradient-Spiral_075.jpg in JPEG format with a 75 quality level. 2. 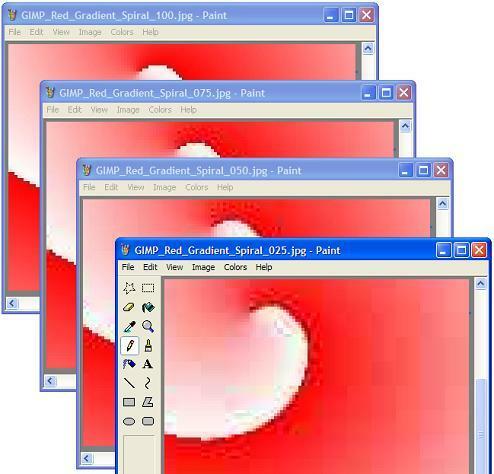 Open GIMP-Red-Gradient-Spiral.xcf and save it as GIMP-Red-Gradient-Spiral_050.jpg in JPEG format with a 50 quality level. 3. Open GIMP-Red-Gradient-Spiral.xcf and save it as GIMP-Red-Gradient-Spiral_025.jpg in JPEG format with a 25 quality level. Obviously, lower JPEG quality levels give us very poor quality images.